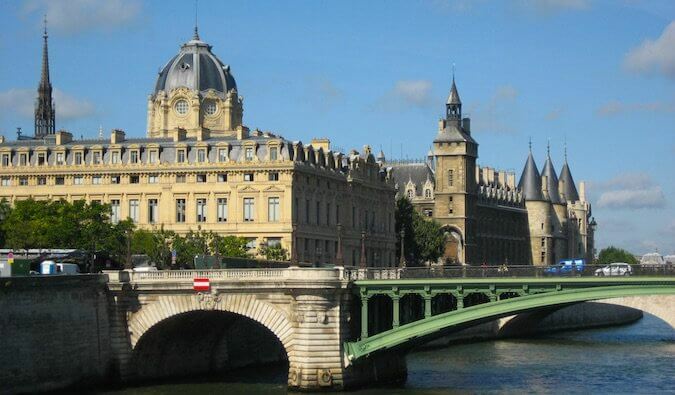 Paris may be known as the City of Lights, but it hides a dark and disturbing history. The Catacombs are what is left of rock quarries built and expanded over the center of the city. Much of the limestone that built the city was extracted from these mines, but as the city grew it expanded to where the quarries were and quarries had to be abandoned. The French resistance used these tunnels during World War II, and rave parties flourished there during the 1990s. Victor Hugo used his knowledge about the tunnel system when he wrote Les Misérables. In 1871, communards killed a group of monarchists in one chamber. 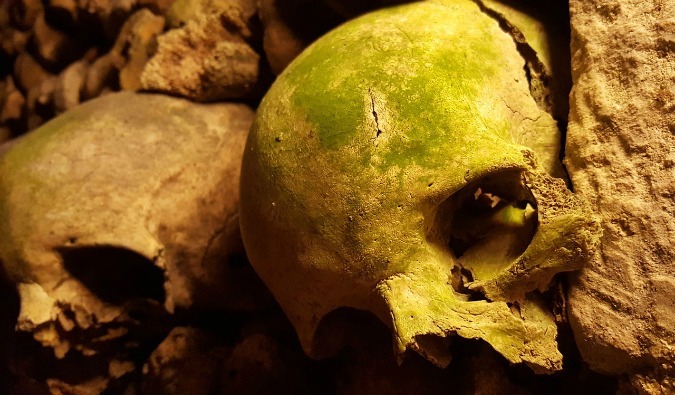 Yet, in this maze of tunnels, one part open to the public – the famous Catacombs of Paris. The Catacombs of Paris were “created” at the end of the 18th century. 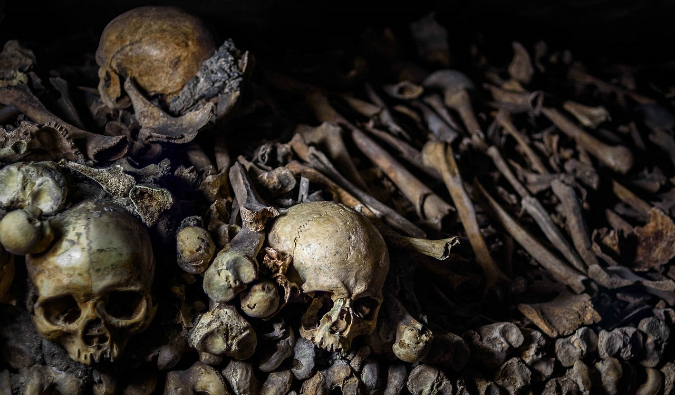 As the cemeteries filled up and had to move outside the city as the city expanded, a portion of the tunnels was turned into an ossuary that contains the remains of millions of Parisians, who gradually transferred here between the late eighteenth and mid-nineteenth centuries. The bones were always moved at night to a ceremony made up of a procession of priests who sang along the way to the Catacombs. At first, they were deposited in a rather haphazard manner and the ossury simply piled up. Eventually, the bones were organized and displayed in the way that you see them today. Since the first day they were complete, the Catacombs have been an object of curiosity, even for royalty. In 1787, Lord of d’Artois, who became King Charles 10, went down there with the ladies from the Court. In 1814, François 1st, Emperor of Austria, went to visit and explore them while he was in Paris. In 1860, Napoleon III went there with his son. The catacomb walls are also covered in graffiti dating from the eighteenth century. Everyone has left their mark on this place. Towards the end of the 18th century, the catacombs became a tourist attraction and have been open to the public on a regular basis from 1867. In the dark galleries and narrow passages, you’ll see bones arranged in a macabre display. Catacombs are eerie. They are quiet, dark, damp, and a bit downright depressing. There are lots of bones around and most of them are just stacked up on each other. You’ll never know who is who – that skull you are looking at could be someone who died from the plague or be a wealthy aristocrat. You never know. I’ve visited this site multiple times and I always find it super creepy yet super interesting. I’ve been to many unusual places over the years, and the Catacombs of Paris is definitely one of the best. The history here is incredible and you can see markings on the walls from the centuries of visitors here. 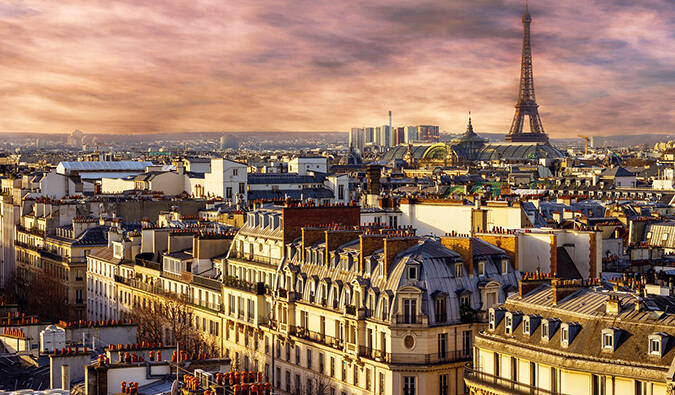 It’s one of the best things to see and do in Paris and should not be missed! The depth of the Catacombs is equivalent to a five-story building. The area is 2 kilometers long. It takes at least 45 minutes to explore the Catacombs. The constant temperature in the Catacombs is 14 Celsius. The surface area of the ossuary is 11,000 square meters. Both sides in WWII used the Catacombs for clandestine operations. The Germans built hidden bunkers while the French Resistance used the tunnels for navigating the city unopposed. To get to the Catacombs of Paris, you can take the subway and the RER to Denfert-Rochereau or use Bus 38 and 68. The museum is open Tuesday-Sunday from 10am-8:30pm (closed Mondays). The number of visitors is limited to 200 at a time so the line can get really long. I highly recommend reserving your space in advance to avoid the line. (Seriously, the line gets to be hours long!). if you can’t reserve a spot, make sure you get there early. Tickets cost 13 EUR for adults, with discounts available. There are audio guides available in English, French, German and Spanish for an extra 5 EUR. They are definitely worth the money if you don’t have a guide as they add a lot of extra information and historical context to your visit. Visiting the Catacombs is one of my favorite activities in Paris. It’s something I highly recommend you don’t skip. It only takes about an hour to wander through completely and will give you a much more nunahced understanding of this historic city. 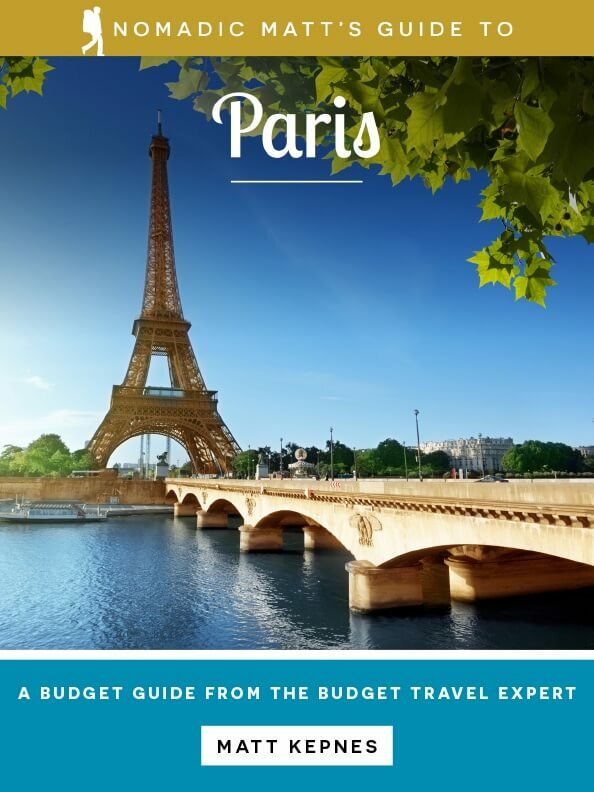 Get Your Guidebook to Paris!! Check out my detailed guidebook to planning a visit to Paris, with suggested itineraries and information on places to stay, things to do, where to eat, and how to get around. 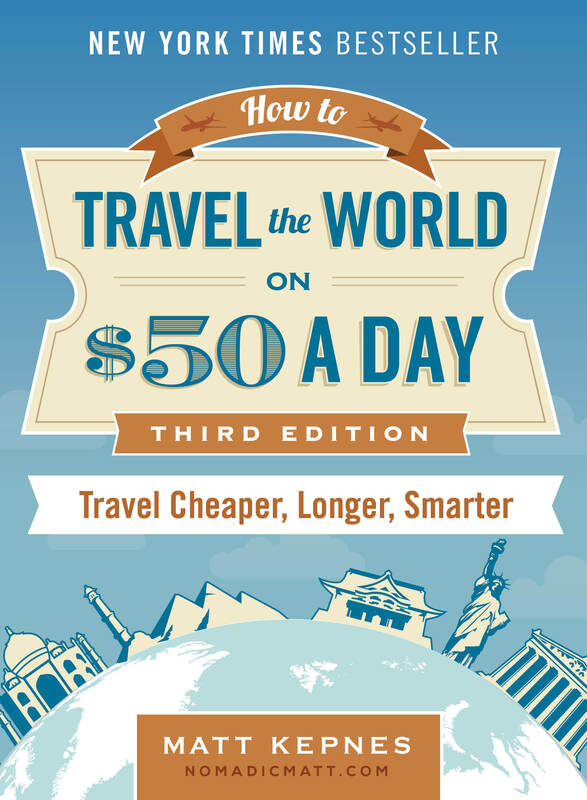 It has all my secrets to having a fun and inexpensive trip there! Just click here to get the guide and continue planning today! Find a cheap flight by using Skyscanner or Momondo. They are my two favorite search engines, because they search websites and airlines around the globe, so you always know no stone is beinkg left unturned. Christopher’s Canal – This location has reliable Wi-Fi, comfy beds, secure lockers, clean showers, free breakfast, and a lively bar. The Loft – This boutique hostel and hotel is located in the diverse and historic neighborhood of Belleville. The hostel also has an awesome outdoor patio, a bar, and a cute cat! Really raves? That’s such a bad idea, but I would have loved to experience that! thats a real depressing story. But very intresting as well. To have all those bones stacked ontop of each other like that, creepy. Sounds super-cool, Matto. I like being underground. There’s a similar attraction in Beijing, dating from the cold-war. I remember seeing a documentary on them once, and thought, hey, thats neat. But never knew about all the famous “A-list historical figures” who visited them. That alone is a cool enough reason to go. I’m hoping to someday live in Paris, or at least in France somewhere, I’ll be sure to check this out once I get there. Looks very intriguing. This is an absolute must-see! The one thing I didn’t like was the 80-something stair walk-up after you’ve been roaming around the eerie maze of skulls and bones for quite awhile! The walk down was longer, but it’s obviously easier to go down. I was also amused to see so many people getting busted for removing remains. Too many people attempt to take a little something with them when they leave the Catacombs. 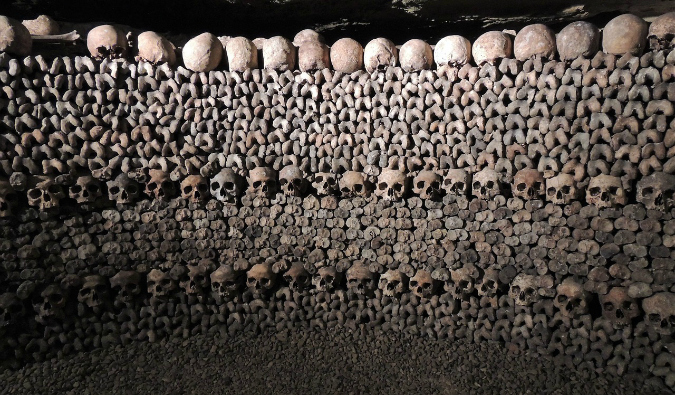 @jen I agree, a rave in the catacombs would be eerie but interesting… big basslines bouncing off of skulls and bones… could have a unique sound to it! You’d have to have a pirate theme to it. All in all I look forward to visiting the catacombs when in Paris! raves would be interesting down in the tunnels!!! creepy but really cool! Very cool! Creepy, but cool. This is going on my to-do list for an eventual trip to Paris. On our 12 hour jaunt through Paris on our layover between Santiago and Johannesburg, we made time to tour the catacombs. It was my second visit, Jeff’s first. The first time I was there the lights went out halfway through our visit. I think they were probably out for less than a minute but it felt like an eternity. I was a little skeptical of visiting the Catacombs, but glad I did. Just a fascinating place and a great story behind it. At the end I was perplexed that we had to be searched, but the Security Guard said that people have tried to steal bones before, going at great lengths, including putting arm and leg bones down their pants or shirts. Worth adding to a 2.5 day itinerary? No, you’re itinerary will be packed already. My wife visited a decade ago. Creepy, sobering and fascinating. Different feel methinks, but seeing those skulls takes me back to my days visiting the Killing Fields in Cambodia. Sobering, sad and just an experience unlike any other. Moving stuff.